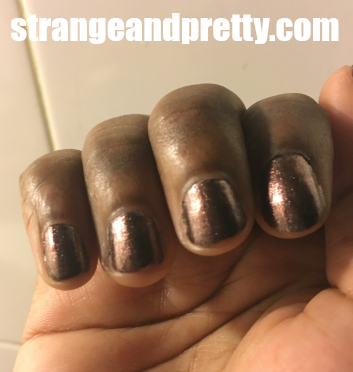 Strange And Pretty: Laquer Love: China Glaze Wood You Wanna? Laquer Love: China Glaze Wood You Wanna? The heavens have answered and have made China Glaze much more accessible in stores here in New York City. So I've been getting my fix of polishes whenever I can. I picked up Wood You Wanna? isn't a color I'd normally go for, as I'm not one for metallics. But this looks nice. It's a mixture of brown, copper, gold, and as I look at my nails right now, I see just a small bit of burgundy. I wanted a break from my normal dark color/bright color scheme I go for, so I tried this. It looks nice on my nails. It actually mesmerizes me when I look at it. It's pretty. Now maybe I'll give more metallics a chance on my nails. Be sure to follow me on twitter for more updates on blog posts and other awesome things!